We open doors to responsible and modern healthcare. Columbia Asia is a healthcare provider offering the uncompromising standards of patient care. We pioneered a modern and efficient healthcare delivery system with its own design and operating software. Columbia Asia was first established in South East Asia in 1995, and is rapidly expanding across South Asia. The hospitals are fully-equipped, multi-disciplined facilities offering quality inpatient and outpatient services. In the prosperous state of Johor at the southern tip of Malaysia, lies Columbia Asia Hospital - Iskandar Puteri. It opened in 2010 and is the company’s first multi-specialty medical facility. This multi-disciplinary specialist hospital caters to residents of new townships in Johor Bahru such as Nusa Idaman, Horizon Hills, Educity, SiLC and Ledang. A 10-minute drive from Johor Bahru city center also Singapore, Iskandar Puteri is a flagship zone of the Iskandar Development Region in southern Johor. Specialist services available include Breast & Endocrine Surgery, Cardiology, Ear, Nose & Throat, Urology, Ophthalmology and Radiology. Our resident consultants are available for consultation during office hours while our 24-hour medical and specialist services are provided by Resident Medical Officers, Specialists and Paramedical Support Team. 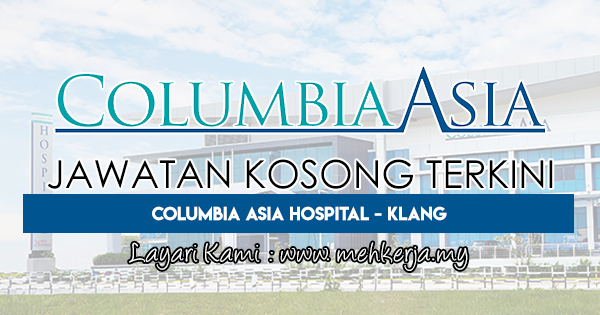 0 Response to "Jawatan Kosong Terkini di Columbia Asia Hospital - Klang - 7 April 2018"